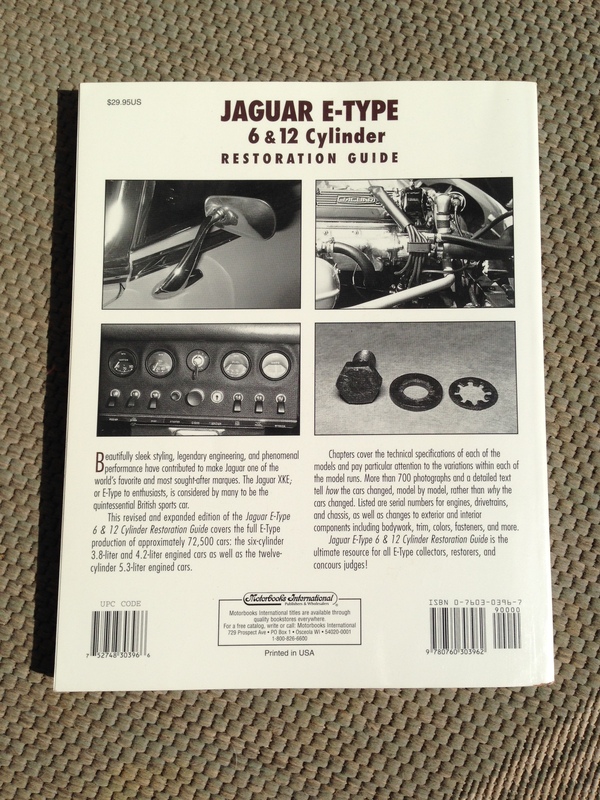 After seeing this book being referenced time and again on E-Type forums, I realized it must be an important addition to the reference materials for anyone interested in a serious E-Type restoration or judging. I was not disappointed. This book is extremely comprehensive and definitely a go-to restoration for questions of E-Type authenticity. Below is a photo of the Table of Contents. The book covers all Series 1, 2, and 3 cars. As you can see by the TOC, it is first organized based on changes with respect to a car’s Serial Number. So if you have a specific car you can zoom right in on what features or changes your car should incorporate. For instance, I was able to determine that my 1967 2+2 should have come with covered headlights. The fact that it did not come into my possession with covered headlights is probably an indication of early collision damage, an interest by an owner to update his car, or the vagaries of the factory assembly process. This last item is a problem that Haddock wrestles with constantly. It is well established that Jaguar introduced updates into the assembly line as parts became available. And if the flow of new parts stopped, they apparently had no qualms about reverting to their stock of older parts in order to keep the line going. And as with any student of history, Haddock was not there when the cars were built. His sources of information include official publications as well as standard publications on the subject. In addition, he used book and magazine articles, correspondence with the Jaguar factory, and of course his personal observation of numerous E-Types. This book is very clinical. It is not a “good read”. But as a reference source, it is fairly easy to follow and very useful. I would never suggest that one attempt to read it from cover to cover, unless you have a photographic memory! But it is fun to read small chunks at a time especially right before or after I am engaged in a judging situation. The chapter on Fasteners is fun to the “Concourista” who likes to get into the minutia of the various markings on the heads of bolts that would indicate originality. The sections on interiors should be quite useful to someone trying to put a “basket case” car back together. Heck, the whole book should be required reading for anyone doing a basket case! Or if your file of digital photos has suddenly disappeared due to your hard drive crashing! 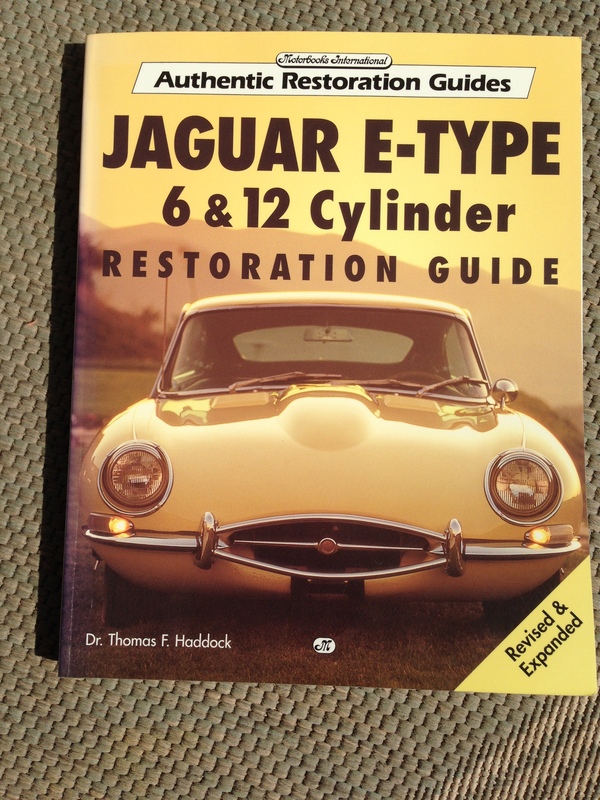 In conclusion, this book should be on your bookshelf if you are a serious E-Type restorer or judge. Absorb it and you will be an expert. Have it on hand to refer to and you will be comforted. Either way, you win! « Book Review – Cat Out of the Bag!